Information or reservation: go to contact. 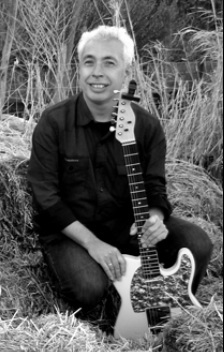 Oscar Bax (1959 - lead guitar). Oscar has grown up in a musical family: The Bax Family. He listened for hours as a kid to top guitarists like Chet Atkins, Jerry Reed, and Harry Sacksoini. His one passion was to do what these guitarists did. The Bax Family became regionally known in 1977 after receiving an award on national television. The years after that the family toured through Holland, Belgium, and Indonesia. They were often asked to play as lead band for international country and rock and roll artists like Jimmy Lawton and Chuck Memphis. He has also performed with Anita Meijer, Oscar Harris, Wieteke van Dort, and Sandra and Andres. Oscar is an all-round guitarist who knows his way around in diverse musical styles: ska, rock, blues, hard rock, pop, and country. He has worked the last years as a band coach and guitar teacher in Spain. He can also play drums, bass, and percussion. In March 2013 he returned to Holland with his wife. Directly after that Matthijs approached him to play with CashFlow as lead guitarist. His things were not even unpacked when they had their first practice rehearsal! “The first number that I learned for our show as a little boy was ‘I walk the line’ from Johnny Cash.” He still plays almost forty years later with the same passion.